Just unveiled in LA, the BMW Vision Next 100 motorcycle concept uses digital innovation to make riders more comfortable and safe. It also looks downright amazing. Last week, BMW unveiled its latest concept at the BMW Group Future Experience event in Los Angeles. It was a fitting location for the unveiling of a machine that looks like it was designed for a Hollywood sci-fi flick. 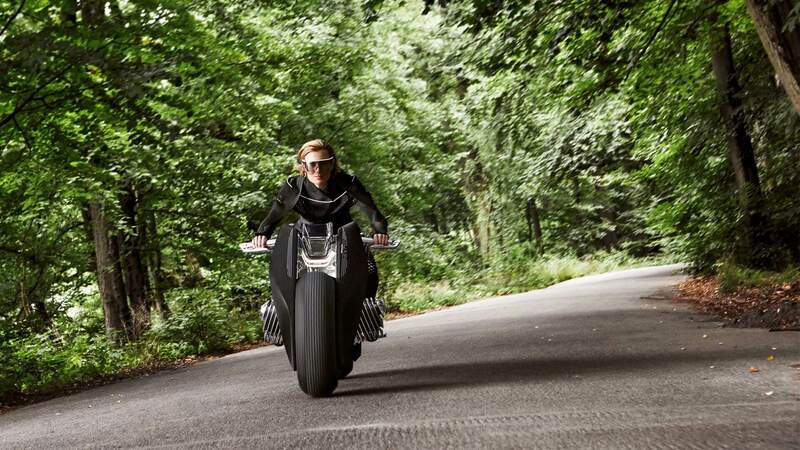 The BMW motorcycle—if we can indeed call it that—is a radical experiment in futuristic form and function. It’s the form that draws you in at first, but it’s the function that really makes you wonder if you’ve found yourself in another Tron movie. Middle-school physics taught us why a bike in motion is stable but one at rest needs support to stay up. Well, not the Vision Next 100. The Vision Next 100 remains perfectly balanced whether in motion or at rest, without needing a stand to hold it up. The technology will make things easier for newbie riders in the future since they won’t have to contend with the fear of falling over, or the physical pain of actually dumping their motorcycle. For the experienced, it will offer a more dynamic ride. The BMW motorcycle comes with its own specialized outfit, of course. The suit may look like it sprung out of a latex fetishist’s imagination, but there’s a lot more to it than appearances. The light textile clothing has an A/C function that can warm or cool the rider depending on ambient conditions. The region around the neck can be filled with air, which BMW claims relaxes the cervical spine, making for a more comfortable ride. It also has vibrating elements built into its body; these will be used to give riders navigation signals or indicate such things as exceeding the limiting tilt angle. Undoubtedly the coolest part about the Vision Next 100 is its safety system. Instead of flimsy physical protection like helmets, BMW takes advantage of a “digital companion” to intervene in any situation in which the rider’s safety may be at risk. The companion is a system consisting of the bike itself and the accessories that come along with it. One such accessory is the data glasses, which take the place of the helmet. It’s a sort of heads-up display (although much cooler-looking) that is designed like a sleek visor. When the rider looks straight ahead, the display clears up to allow for the clearest view of the road. Looking up makes the glasses display the rear view. Lowering the gaze opens a menu containing options such as map views and other relevant data. The motorcycle takes over if the rider seems to be in danger of an accident at any point while interacting with the glasses. Most concepts showcased at expos by automotive manufacturers never make it to production. Those that do are significantly watered down versions of the prototypes that inspired them. It would be a shame if anything about the Vision Next 100 were to change in the process of translation into a mass-market offering. We have a good 20 years to see how it turns out according to BMW; something tells me it will be worth the wait. So helmets won’t be needed, so how does the motorcycle jump to your defence when that pickup truck runs the light and launches you 100 feet down the road? how many sad souls will loose there life farting about with the data glasses, motorcycles are deadly machines, especially in the hands of hipsters and people that would otherwise be marveling at technology vs looking out for what’s round them. A tad too modern for my liking. I like the purr of the engines, the response from the engine, and the gutsy feel of mechanical power. Bikes should look like bikes.And here in the UK you would still have to wear a helmet by law.So a car pulls out on you,hits you hard side on and the bike protects your head.Dream on. Hold on!! !……I can and will fall off my Bike and no doubt hit my head on Concrete, Asphalt and Rocks…….I don’t care if the bike can stand by itself, mow the Lawn or feed the Dog, I even wear my helmet when swimming…..If you ride on California freeways,…..WEAR A HELMET, let the Germans go without, they have Thick Skulls and Square Heads!!!!! Lots of states here in the US where riding without a helmet is legal. In Germany, not so much. the rear fender tells you the designer has never ridden a bike in the rain. What a load of cods wallop!!!! My Helmet and Leathers boots and gloves saved my live in a crash, bird flew out of a tree line and I hit it, or it hit me ( all happened in a split second ) would never ride with out a helmet regardless even on my push bike, c’mon BMW build it but with free helmet with the Gucci shades thrown in!!!! No helmet, eh? Someone’s never been hit in the face with a bumblebee at 100kph, or ridden in heavy rain or hail. German bumblebees wear helmets so that you don’t need to. What happens when the giro fails. Also being a biker I would never go without a helmet on for crash protection unless they have designed a star trek like shield around the bike. Silly comment this. This Concept design is from someone straight of a push bike. And straight out of UNIVERSITY. This thing would be totally cool to see in person. First I am thinking that a watered down version of this would be something nice for teaching new riders how to get the feel of the bike. Very technologically advanced to say the least. For BMW to say they want to build AND sell something like this is a huge goal. At the same time, the gyros and sensors used to make something like this possible are simple enough that you just never know.